The origins of this ancient site date back to Roman times, but the castle foundations were first documented in 1141 when it served as an outpost on the road to Parma. For the most part, the castle belonged to just a single family—the Scottis—until the beginning of the 20th century. The family made the castle the cultural center of the area. Famous visitors of the 20th century included film stars Mary Pickford and Douglas Fairbanks, writer Elsa Maxwell, artist Max Ernst, artist and film maker Jean Cocteau, and pianist Arthur Rubenstein. Parking is not near the castle, so bear this in mind if you’re burdened with heavy luggage. Also, some rooms are up a couple of flights of steps. The best rooms are inside the castle or in the tower. Yes, church on site. Inquire hotel for details. Any castle lover will find this setting wonderful. 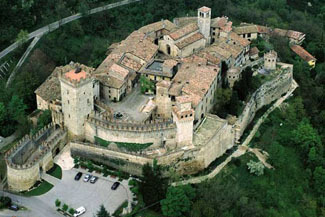 A crenellated medieval and Renaissance wall surround both the castle and its ancient village. There are even three different portcullises and the traces of a drawbridge at the entrance of the village. The hotel exudes lots of appropriate atmosphere with wall tapestries and suits of armor in the public rooms. Most of the guest rooms are suites inside the main castle with a few in an annex just outside. Not the big tower, but the smaller one holds a suite as well. Here you’ll find a four-poster bed and a loft. The comfortable suites inside the castle are named after colors, such as red, pale blue, yellow, pink, and green, and decor and fabrics inside reflect these color schemes. Period furniture and old paintings give an historical touch. Views from the rooms can be of the village square, its fountain, or of the hillsides. On the ground floor a restaurant features cuisine and wines of the region. You can enjoy breakfast while looking out at the valley below from your table. Wi-Fi in the public areas only. Part of the movie Lady Hawke with Michelle Pfeiffer and Rutger Hauer was filmed here. Small museum with historical documents and photographs are located in the large tower in front.